The fact is that there is always much more film shot than can ever be included in the finished product: on average, about twenty-five times too much – which would mean fifty hours of material for a two-hour film. Sometimes the ratio is as high as a hundred to one, as it was on Apocalypse Now. And films are almost always shot out of sequence, which means that on the same day the crew could find themselves filming scenes from the beginning, the end, and the middle of the script. This is done to make the schedule more efficient, but it means that someone – the editor – must take on the responsibility for finding the best material out of that great surplus and putting it in the correct order. So much for the mechanics of editing. But of course the film editor is not so much a technician as an artist, and collaborator in conveying the vision of the film. 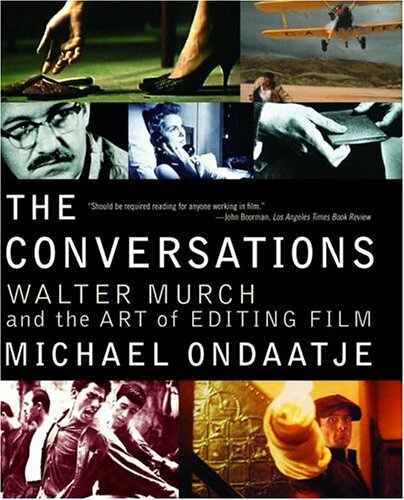 When it works, film editing – which could just as easily be called ‘film construction’ – identifies and exploits underlying patterns of sound and image that are not obvious on the surface. Putting a film together is, in an ideal sense, the orchestrating of all those patterns, just like different musical themes are orchestrated in a symphony. It is all pretty mysterious. It’s right at the heart of the whole exercise. The first work of the editor is therefore that of attentiveness to the material. Our editor, Paul Maxwell (Sione’s Wedding, The Tattooist), is currently doing his first pass on the material which was gathered during our five week shoot. For the moment he’s working alone, sequestered in a darkened room with an Avid suite. Paul, as a rule, doesn’t like to visit the set during shooting. He’s not interested in how the footage was shot, or what we were trying to achieve. He wants to work with what he sees before him. And at this stage, to work in quietness and concentration. When the first pass is complete, and he has assembled the entire storyline, our director Rosemary Riddell will review it with him. And then the serious collaboration begins as they work together to realise the intended narrative of the film. Of course there are also technical details to be attended to in post production – the mixing of sound, colour correction and so on. It’s astonishing how much of the way a film is perceived is dependent on the soundtrack. We also have a reasonable amount of chroma keying done for several blue-screen sequences. The most challenging of these can be seen in the screenshot below. 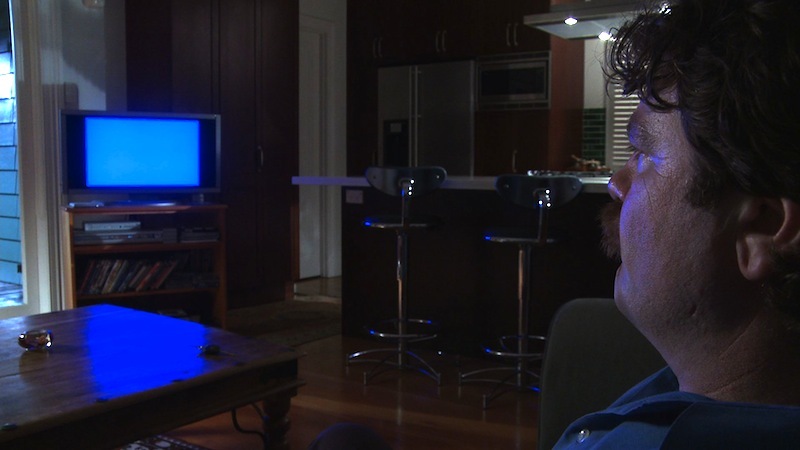 Here the blue screen was created through playing a chroma DVD through the television. Unfortunately the blue light has spilled all across the table and even shows up reflected on the bar stools and other surfaces. With restrictions on how long we had this location available for, we had no opportunity to reshoot. That means we recognised the problem while watching dailies, but made the decision it would need to be fixed in post. Currently we’re talking to vfx experts, who advise it will take around 4 days to fix the scene. As we proceed, we’ll keep you posted on post. Ooops. Sorry baout the blue Mike – I new it was there, just thought we’d fix it like we always did – for a moment we were big time – forgot we were frugal filmmakers. Sincere apologies. Hey, wasn’t meant to be critical – just an illustration of the things that happen in shoot that need to be fixed. We were always the best frugal filmmakers we could be, and inspired by your genius. Hope London is going well.